Many thanks to all those parents who attended one of our Maths information sessions. The PowerPoint form the presentation can be downloaded here and the calculation policy can be found here. 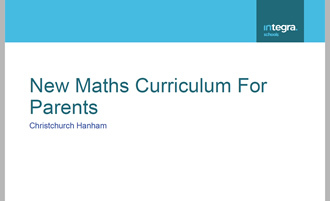 If you have any questions regarding the new maths curriculum please talk to your class teacher. When you read to your children, or they read to you, discuss any aspects of maths that arises in the stories. Remember this doesn’t just involve number, but could be time, shape and space or pattern. Games often involve the use of dice. 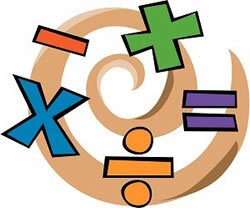 Encourage your children to do the mental calculations and ask them how they worked out the answer. You may surprised at some of their ingenious strategies! In the following activity areas there is ample opportunity to extend vocabulary and provide mathematical experiences which are relevant and enjoyable. Talk to your children about what they have done at school. Don’t be discouraged or alarmed if they deny having done any maths; much of the mathematical work that goes on in school is in the form of play activities, particularly with very young children, and they, or you, may not realise that by ‘playing’ with a box of different shapes they are beginning to develop concepts in their own minds related to measurement, area, angles, volume, and data handling. Many activities which have no obvious links with maths can prove a rich source of mathematical conversation which will extend ideas and vocabulary. Think of the simple shapes that you can see around you at home. How many times do you see numbers written down? Which plants in your garden are tallest? What do you need to do to cook a meal? How long does it take to run a bath? 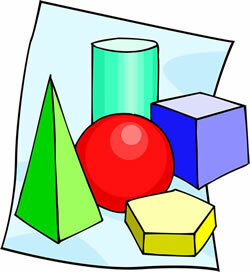 Many of our children’s free play or role play games have some mathematical content. Conversation and thoughtful questions can help in concept formation. Have I written enough invitations? Have I laid enough places? Have I got enough chairs? Are there enough sandwiches for two each? What shapes can I cut the sandwiches into? What shapes are the plates, sandwiches, biscuits, cakes? Can everyone have a jelly? There is also the opportunity to consider capacity here. How many cups can I fill from this jug? Do all the cups hold the same? Water and sand play are useful ways of developing concepts of volume and capacity, as well as improving hand and eye co-ordination. Encourage your children to take unbreakable containers into the bath with them and to fill one from the other. Which do you think holds more? How many eggcups do you think will fill a yoghurt pot? Ask your children to estimate the answer before they work it out. Initial guesses may be wildly inaccurate, but that shows that, as yet, concepts are imperfectly formed, and that lots of practical experiences are needed. Gradually, as children develop a growing awareness of volume, their estimates will become more realistic. ‘What do you notice?’ or ‘What do you think?’. Encourage your children to observe, to discuss, to generalise and to hypothesise; even if their thoughts are based on fallacy, they are beginning to make inferences from their past experiences. Have you ever said ‘I was no good at maths at school’? Can I push the trolley through this gap? Can I carry all this shopping home? Will it all fit in the cupboard? Is this enough food for us all? Is this product better value than that one? Am I tall enough to reach that top shelf? Have I got enough money to pay for it all? Which checkout queue will move fastest? What money do I need to hand over? What change should I get? Did you have to cook anything? Consider how many different aspects of maths go into making a meal! Here are some ways that you can involve your child in simple maths activities related to your everyday life. Not all of them will be possible or practical for all of you, and it is not suggested that you undertake all or even some of these activities every day, but if you can reinforce the work being done at school and help your child to appreciate the relevance of maths then your child will benefit. How many places do we need to set? How many dishes do we need for each course? How many dishes do we need altogether? Are there enough cups or glasses for everyone? Are there more dishes than glasses? These questions and activities are designed for one-to-one matching, and to introduce the concept of more than and less than. Kitchen cupboards contain a good supply of mathematical materials. Apart from the obvious scales and measuring jugs there are different sized tins, different shaped bottles, boxes and cartons, all excellent for shape work. Allow your children to sort them in different ways, making sure there are none that could be dangerous in any way. You may have lots of different sized mixing bowls and saucepans, baking tins and storage jars, these will benefit your child’s understanding of volume and capacity. 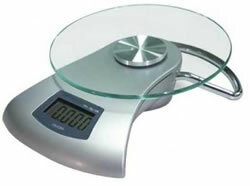 Activities could involve weighing, capacity, size and shape (rolling out pastry or dough), and time. With much older children the activities could be extended to include fractions, and ratio (increasing or decreasing the quantities of ingredients to cater for more or fewer people). If children are rolling out pastry or dough encourage them to talk about what happens to it. It gets bigger/longer/wider/thinner etc. Is this bowl large enough for all the ingredients? What shape is the tin/pan/frying pan? What will happen to this dough if I roll it out? If I use this cutter will the shapes fit together without leaving scraps? How many biscuits can I get out of this rectangle? How many can I fit in this tin? How many rows can I fit in? How many little cake cases will I need for this mixture? Do you think I will be able to clear up before is cooked? If you make your own clothes or your own curtains there are lots of opportunities for children to consider length and spatial concepts, as well as pattern. Children can become familiar with the sight of you measuring and cutting out accurately. You may have to match patterns, so the idea of repeating patterns and even symmetry can be introduced. If you have material left over, children could be encouraged to look for patterns, repeating or symmetrical, to fold it in half, or to measure. At the very earliest stages children do not use standard measures, but could be encouraged to measure their piece of material against cotton reels, pencils, conkers, sea shells, pine cones, or anything of suitable size that will not generate larger numbers than your child is happy with. Patchwork is a hobby full of mathematical possibilities, from the variety of shapes used and their properties, fitting shapes together without leaving gaps (tessellation), symmetry, both reflective and rotational, to estimating quantities of fabric required, not to mention how long you think it will take to finish it! Similarly, if you are decorating, you could talk about paint tins, their size and shape. Consider the roll of wallpaper; why is it rolled up? Are there any patterns to be seen; how often do they repeat? How many rolls do you think I will need to wallpaper this room? 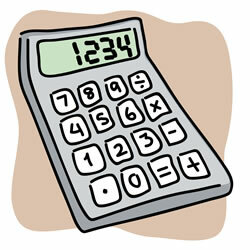 Older children could help you to calculate the cost. If you are retiling, talk about shape and size. How many will I need for this wall? Do you think I will need to cut any? Will I need pieces that are smaller than a half or bigger than a half? Look at the patterns on tiles. Are they symmetrical? Talk about fitting tiles together without leaving gaps (tessellation). Do your tiles fit together? Cut out some cardboard ’tiles’ the same size as the ones you are putting up (cereal packets will do) and allow your children to copy the pattern on the tiles, simplified if necessary, and to explore different ways of fitting them together. Whether you are a keen gardener or not, the garden, the park, or even a walk round the local roads gives plenty of scope for maths. Consider the shape of your garden, your lawn, your flower beds. Is it paved, and if so what shape are the paving slabs? Do they fit together without leaving spaces? If they do leave spaces what shape are they? Can you copy the pattern? Are there any different patterns anywhere? Allow young children to compare sizes without measuring; this encourages development of the concepts of bigger than and smaller than. Look at plants, flower beds, and trees. Encourage children to try to explain why they think one plant is bigger than another; it may be taller or fatter. In this way mathematical language will become more precise. Pace out the size of the garden. This should help to reinforce the idea of the need for standard measures. How many bricks go under the window, or above the door? Older children could estimate how many bricks were used to build the wall or the house. Allow young children to compare sizes without measuring; this encourages development of the concepts of bigger than and smaller than. Look at plants, flower beds, and trees. Encourage children to try to explain why they think one plant is bigger than another; it may be taller or fatter. In this way mathematical language will become more precise.Pace out the size of the garden. This should help to reinforce the idea of the need for standard measures. How many bricks go under the window, or above the door? Older children could estimate how many bricks were used to build the wall or the house. Sometimes summer bedding is planted out in regular patterns. Ask children if they can see a pattern, explain it and tell you what will come next. Sunflowers have a lovely pattern in their seedhead; do any other flowers have patterns like this? Sometimes summer bedding is planted out in regular patterns. Ask children if they can see a pattern, explain it and tell you what will come next.Sunflowers have a lovely pattern in their seedhead; do any other flowers have patterns like this? Look for symmetry in leaves, flower heads, butterflies and other insects. Do you remember the game Beetle? Insects all have six legs. There are lots of number activities that could be based on six, or eight if you see a spider. Children often have problems with the concept of money; in particular they find it difficult to appreciate that two 1p coins are equal in value to one 2p coin. It will help your children if they are given the opportunity to become familiar with handling and recognising money. Allow them to handle real money, if possible. To begin with only 1p and 2p coins are necessary. Play at shops with your children so that they develop the concept of exchange. Later give them a wider variety of coins to handle. Encourage them to talk about the colour, size, shape and value of the coins. Let your child sort them in different ways. Allow your child to watch you shop, handing over cash, and receiving different coins in change; explain what has happened. If at all possible allow your child to buy something small; this might be a packet of sweets or a drink. (Have you thought about how many different maths activities are contained in a tube of Smarties!) Let them pay and get change. Help them to look at the coins they get back. They may be confused if they hand over one coin and receive more than one coin in change as well as their goods. Children often have problems with the concept of money; in particular they find it difficult to appreciate that two 1p coins are equal in value to one 2p coin. It will help your children if they are given the opportunity to become familiar with handling and recognising money. Allow them to handle real money, if possible. To begin with only 1p and 2p coins are necessary. Play at shops with your children so that they develop the concept of exchange.Later give them a wider variety of coins to handle. Encourage them to talk about the colour, size, shape and value of the coins. Let your child sort them in different ways.Allow your child to watch you shop, handing over cash, and receiving different coins in change; explain what has happened. If at all possible allow your child to buy something small; this might be a packet of sweets or a drink. (Have you thought about how many different maths activities are contained in a tube of Smarties!) Let them pay and get change. Help them to look at the coins they get back. They may be confused if they hand over one coin and receive more than one coin in change as well as their goods. However you travel, by foot, bus, car, train, or aeroplane there is a lot of maths involved.If you are going somewhere on foot make a maths trail in advance if possible. Look at the numbers you can see. There may be dates on houses, or Roman numbers on pillar boxes. What about house numbers? There are lots of shapes to be seen. Telephone boxes are cuboid. Estimate their size. If they are older boxes, how many panes of glass? Pillar boxes are cylindrical with a small cone on top. There are other shapes on the boxes. Make a list of round things. Can you see any repeating patterns on buildings? What sort of traffic did you see? How much time does each stage of the journey take? How many people get on or off the bus? How much was the bus fare? How many passengers are children? Was there a timetable at the bus stop? How many cars pass you? How many times do you stop at traffic lights? Add up the digits on number plates. Are the number plates odd or even? Find the product of two, or even all of the numbers on number plates. What numbers are factors of the number plates? Make a conversion graph for the currency of the country you are visiting. Many holiday brochures show block graphs of temperature; discuss what these mean. Estimate the volume of your luggage. Initially, helping with number will be simple activities counting, matching, and eventually writing numbers. Allowing children to trace their finger over number shapes helps them to realise the orientation of some numbers and may discourage reversal. Sheets of sandpaper cut out in the shape of the numbers are useful. Encourage children to form their numbers correctly; when writing numbers they should begin at the top. The number 8 should be written in one movement, not as two separate circles. Bad habits developed now are very difficult to break later on, and legibility of script is very important. Number facts have to be learned at some stage, but it is important that children have an understanding of the meaning of number, addition and subtraction first. Allow them to play with different counting devices; anything can be counted. Let them add counters and take them away. You can practice addition and subtraction facts to 10 in the form of games, and at a later stage facts to 20. Later on, children will need to learn their tables, 2, 5, and 10 first, but they should have had lots of practical activities first. 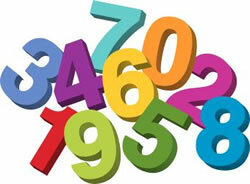 A knowledge of the 2 times table means that children can double numbers – an important skill in mental calculations. From doubles children can then find near doubles, one more than or one less than. Remember to say to your children ‘How did you do that? I did it this way’. Encourage a range of strategies, such as adding nine by adding ten and subtracting one, for example. Discuss any patterns. Help children to realise that if they can add 3 + 4 to make 7 then adding 30 + 40 to make 70, or 300 + 400 to make 700 is only a small step. In some cases the use of a calculator is beneficial; this can open up interesting areas of mathematical exploration that might have been denied to your children by the sheer complexity of the computations involved. Discourage them, though, from reaching for the calculator at every stage. Aim to develop their mental strategies and talk to them about how they worked out an answer. Tell them how you did it. You may well have used different methods and can learn from each other!